“Upperclass yet socialist, foreign yet nationalist, Inji Aflatoun wasn’t one to be easily labeled,” writes Your Middle East’s Goos Hofstee in this extraordinary historical portrait. From aristocratic child to political socialist, from Catholic schoolgirl to feminist activist, from dark and moody surrealism to bright and colourful expressionism, everything about Inji Aflatoun’s life and work was about rebellion and reinvention. Inji Aflatoun (1924–1989) was one of the most important and groundbreaking Egyptian visual artists, and a pioneer of modern Egyptian art. She was also a nationalist, a Marxist and a women’s activist. Now, a new exhibition in Cairo shows Aflatoun’s work and tells the story of the artist herself. Aflatoun was born in Cairo in 1924 into an Egyptian aristocratic family. She grew up in a comfortable upper class environment, and her upbringing was elitist and European in both orientation and custom. However, as she grew up, the young Inji started to feel disconnected from her Egyptian roots. She felt she knew nothing about the country she was born in, and that she had no real connection to her own people. This sense of detachment was reinforced at the elite Catholic girls’ school Aflatoun attended at the time, which had a strong class structure, very strict rules, and infused in its pupils a sense of alienation from Egyptian culture. After a few years at the school, Aflatoun could no longer stand the restrictive atmosphere and, in keeping with her rebellious spirit, was eventually expelled from the convent. Bored with her bourgeois environment, Aflatoun turned to art to escape. When Inji was 15 her family was visited by the celebrated artist Mahmoud Said. Said instantly recognized Inji’s potential and encouraged her to pursue a career in the arts. On his recommendation, Inji started to be mentored by the artist Kamel el-Telmessani, who introduced her to surrealist and cubist styles of painting. Surrealism greatly influenced Aflatoun’s own work from that period, as can be seen in one of her earliest pieces, The Girl and the Monster, from 1941. Aflatoun quickly developed herself as an artist, and by 1942 she had participated with the esteemed “Art and Freedom” group in a number of avant-garde exhibitions. El-Telmessani, who had introduced her to the Group, was a founding member of the Egyptian Art and Freedom movement, launched in 1939 with the intention of using art to liberate mind and nation. It was that same El-Telmessani who also introduced her to political socialism and told her about the struggles of the Egyptian peasants, which ignited her interest in politics and Marxism. In both her art and her political awareness, Aflatoun was deeply influenced by the Egyptian Art and Freedom Group. Her growing preoccupation with the political and social problems of the time would prove to be the inspiration and force behind many of her greatest and most respected works. However, it would also get her in serious trouble in later life, when the Nasserist regime would be less tolerant of political critics. Meanwhile, Aflatoun’s work started to become increasingly political in its message, and often depicted the plight of the working masses. She also adopted a new, more realist style, as she felt that surrealism no longer fitter her. “My main desire during that time was to express the reality and the dreams of the working man that toils under horrendous working conditions, without a law that protects him,” she writes in her memoirs, “I wanted to reveal the exploitation of man to man.” This concern with the people, and especially with the underprivileged masses, finally led her to join the Communist movement Eskra in 1944. During this period, Aflatoun also became a strong proponent of women’s causes. 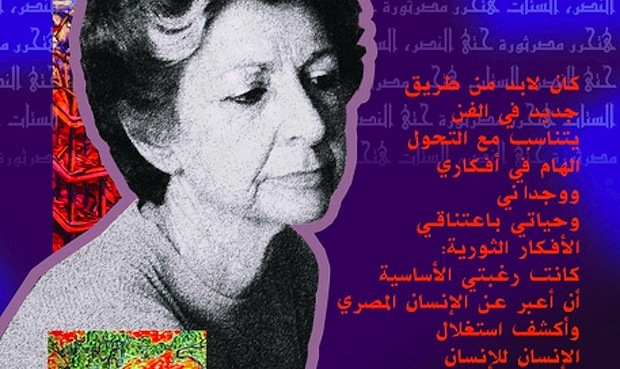 Alongside other rebellious women such as Soraya Adham and Latifa Zayyad, she became one of the standard bearers of the feminist movement in Egypt. In parallel to being feminists, these women also had communist ideologies, which was something that resonated with Aflatoun. In her view, to be a feminist and to be a Marxist/socialist were two sides of the same coin, as both the struggle of women and the struggle of the proletariat were caused by imperialist oppression. Both groups were “others”, an expression she often used to refer to the poor, weak and disadvantaged within Egyptian society, all of whom were suffering from the social and political system. To revive the waning Egyptian Feminist Union, Aflatoun co-founded the Lagnat al-Shabaat (Committee of Young Women) with Ceza Nabarawi. Developing her own feminist ideas even further, Aflatoun then went on to write two important and popular political pamphlets, Thamanun milyun imraa ma’ana (Eighty Million Women with Us) and Nahnu al-nisa al-misriyyat (We Egyptian Women), which was an analysis of women’s oppression and national oppression. Meanwhile Aflatoun’s work became increasingly well received, both in Egypt and abroad. She had individual exhibitions in Cairo and Alexandria and even showed her work at the prestigious Venice Biennale in 1952. Her work from this period shows that Aflatoun’s political interest had not waned. Pieces like Roohy enty Taleka (Leave, you are free), El-Zawga El-Rabaa (The fourth wife), Yaamal Kalrejaal (They Work like Men) all have a clear social/political theme. A piece like Lan Nansa (We won’t forget), in which she has drawn upon the mass demonstrations of November 1951, even shows a straight out revolutionary air. After the revolution of 1952, Aflatoun continued her earlier writing for the liberal Wafdist paper, Al-Misri, and also worked with the Popular Committee of Women’s Resistance. Obviously, Aflatoun was not alone in her political activism, and by the 1950’s, the popularity of the communist movement had become increasingly troubling for the Nasserist regime. Eventually in 1959, Nasser ordered a big roundup of political dissidents, all of whom were secretly imprisoned. Aflatoun was among them. Her critical stance against the establishment, and her desire to participate in her country’s political development, had led her to be arrested and sent to Qanater prison for four years. In her memoirs Aflatoun describes her experience in the prison as an encounter with a whole different side of society, one that as an upper class woman she had never seen before. This experience of the real underbelly of Egyptian society proved to be very hard for Aflatoun, and she had a strong desire to somehow escape the misery. “When I first entered the prison I had a strong urge to draw and not to give in to the reality,” she writes in her memoirs. However, Aflatoun was initially not allowed to work in prison, which pained her enormously. Fortunately, she eventually gained permission to continue working, but only on condition that her work would become the prison’s property. The pieces she made during her time in prison became increasingly expressionist and are testimony to the anguish Aflatoun experienced. On the one hand, they show the grim reality of life in prison, with its claustrophobic spaces, its striped uniforms and its bunk beds. On the other hand however, other pieces show Aflatoun’s undiminished hopes and desires, with dreamlike depictions of the scenery outside the prison, such as in Tree behind the Wall. The serene and idyllic courtyard scene we see in A night behind Prison Bars makes Aflatoun’s longing for freedom almost palpable. However, her most captivating work from this period are the portraits she made of the women inside the prison. Showing both their strength and their torment, she paints them sitting companionably together in the ward, but also staring at the viewer with hauntingly mournful eyes like in Girl Behind Bars. As she was now approaching sixty, Aflatoun eventually started to scale down her participation in politics and social activism. She devoted more time to her art and withdrew herself increasingly from her former life as an activist. However, while she now favoured art over activism, her critical spirit remained intact. Inji Aflatoun remained a rebel until the end. Upperclass yet socialist, foreign yet nationalist, Inji Aflatoun wasn’t one to be easily labeled. Typically, her art is equally difficult to classify. Her subject matter in her early work is typically surrealist, and very different from the focus on landscapes and the “indigenous heritage” in her later work. Aflatoun’s pieces echo multiple styles, influences and inspirations. An early piece like Girl with Monster for example can remind us of, say, the mysterious landscapes of Max Ernst or Andre Masson, while the style she uses in a work like Tree behind the Wall is more reminiscent of a Bonnard or Vuillard. Row of Prisoners meanwhile, with its swirling brushstrokes, immediately brings to mind Van Gogh, and the technique he displays in for example his famous Starry Night. However, while all these references can be made, Inji Aflatoun was not one to copy styles or techniques, instead she took inspiration from everything she saw and made it her own. “A Life in Struggle” is shown at the Safar Khan gallery, 6 Brazil Street, Zamalek, Cairo. More work of Inji Aflatoun is on permanent display at the Amir Taz Palace,1127 al-Soyoufeya street (off al-Saliba street), al-Khalifa, Cairo.